13 Responses to Papa Luciani! I am delighted to have stumbled across your blog and to learn of your devotion to Pope John Paul I. I have loved him since his election 30 years ago, and he is also my “personal patron” as well as my model as a writer. I am working on translating as many of his untranslated writings as possible and have put some of them on my blog. I am also writing a full-scale scholarly biography of him, including refutation of the absurd murder conspiracy theories. I have a number of posts on this. I’d be delighted if you find something you would like to link to on my site. I will link to yours. I am also thinking of getting together a conference for Papa Luciani for the centenary of his birth in 2012, and starting an e-mail newsletter on him. Please let me know if you are interested. Do you know Italian well? I have read a lot of his writings in the Italian original. I am happy someone is giving as much time and energy to Papa Luciani as you say you are. I was able to be near him in several ways in August – September of 1978, served for his installation Mass, and heard him speak. I have little doubt he is a saint in heaven, and I wish we would have had the opportunity to have had a lengthy Luciani papacy. Thank you for linking to my site. I will explore yours and get back to you. Does anyone know where one can find a copy of the video of any of the significant events in Pope John Paul I short papacy? His first blessing Urbi et Orbi, Installation Mass, Funeral Mass? Any documentaries on his life? I have some video from “Time and Again” a short half-hour special about Pope John Paul I which was shown during the final illness and death of Pope John Paul II in 2005. I saw a documentary on his life while in Salt Lake City (ironically) on one of their PBS stations, or perhaps on their BYU station, but cannot remember what it was. Any help on this front would be most appreciated. I do not have any video of John Paul I in my possession. You can search for him on You Tube and find a number of short clips of him during his papacy. RAI, the national Italian television company developed a good movie about him several years ago, but it is in Italian, so if you don’t know the language, you are at a disadvantage. I would recommend you contact Dr. Lori Pieper (see her comment above and the link to her website). She is the most authoritative person I know about John Paul I and can tell you what might be available. Good luck! Stop by again, and let me know how it goes. By the way, what whets your interest in Papa Luciani? This is rather late, I know, but I only now ran across this question. 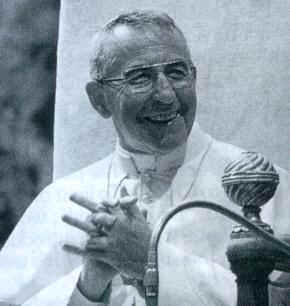 I myself have put up some videos of John Paul I on YouTube through my own channel, TauCrossMedia. You can search for the channel there. I have a copy of a documentary on JPI done by the daughters of St. Paul in, I think, the early 80’s, but not of very good video quality. I was never able to find it again an presume it’s out of print. I remember a special on him that aired (I think) on the History Channel some years ago, in the 1990’s, it may have originally been produced by the BBC. Maybe that’s the same one you saw on PBS? I would love to find the original as well. I would dearly love to see that “Time and Again” program, because I missed it! I appreciated reading your blog about Papa Luciani. If you understand Italian, the following is a recent and excellent documentary produced by don Giovanni D’Ercole for his TV programme, “Sulle Vie di Damasco” (Italian TV, RAI 2), in which he brings to light the PERSON of Albino Luciani, with all his intelligence and great humility. On the other hand, the documentary produced by RAI 3 (notorious for its anti-church sentiments) highlights little more than the so-called “mystery surrounding his death”. I highly recommend the recent documentary produced by Fr. Giovanni D’Ercole (at above mentioned link). Allan, I am very happy you stopped by and left a message. I am curious. You mention that Papa Luciani was the bridge connecting both sides of the journey of our Catholic faith. Can you say more about the two sides of the journey? I know that Archbishop Robert Sanchez of Santa Fe was at the first Ad Limina of His Holiness John Paul 1. Is there any way you might be able to point me to pictures of this meeting? David that’s a good question. I don’t have a ready response. Your best bet is to contact the Vatican’s photographic service and request one. Undoubtably they took several and they are filed somewhere. My understanding is they can be purchased although I can’t be certain. The other place to go would be the archdiocese of Santa Fe and see if they have retained a copy. I saw the EWTN movie: John Paul 1: the Smile of God, and I have been trying to locate English subtitle, anything, copy, for the full about 3-hour movie I’ve seen in Spanish and Italian. Anyone know where I might get it? Am currently reading the English translation of Illustrisimi. I’m taking my time reading it, and finding it inspiring. I read somewhere that his writings are not great literary pieces. I beg to disagree. I have a copy of the movie made available through Ignatius Press. It is in Italian with English subtitles. Contact Ignatius press, and you can purchase a copy.